*PHOTO Caption: Pictured are Lundy Hedges, Guardian Angels Medical Service Dogs Volunteer, Sarah Baechler Davis, JD, Executive Director HSN, Lynne Becker DVM Foster Family Training Coordinator, Nanci Wachtel Foster Trainer with foster service dog in training, Denek and Jon Forester, Director of Community Affairs at HSN. Guardian Angels Medical Service Dogs, Inc. is a 501(c)(3) non-profit organization with a mission to raise, train and then donate the finest medical service dogs to veterans and others to mitigate the effects of conditions such as PTSD, Traumatic Brain Injury, glucose imbalance, seizure disorders and mobility issues. Since our beginning in 2010, we’ve paired nearly 300 individually trained, federally protected medical service dogs to those in need. With up to 1,500 hours of training per dog, it is a long process, but worth every moment when you see the results of Unleashing the Power to Heal, and the life-saving, life-changing difference it makes for our recipients. 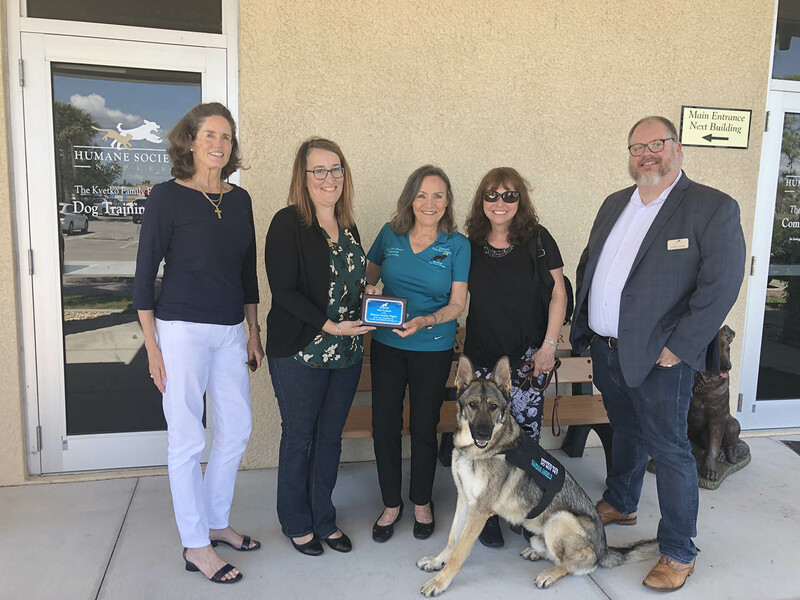 "We would like to recognize and thank Humane Society Naples for the past five years, for being a gracious partner that has extended their facility to us every week where we hold service dog training classes," said Carol Borden, Guardian Angels Founder.